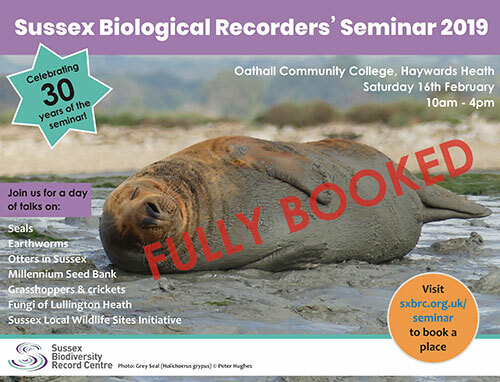 The 30th Sussex Biological Recorders’ Seminar is now fully booked! Join us from 9:30 am on Saturday 16th February 2019 at Oathall Community College, Haywards Heath for a day of talks and chat. We’ve got some great speakers lined up this year: Steph Miles and Jenny Peach from Royal Botanical Gardens Kew will be talking about UK seed conservation, and Bjorn Beckmann, from the Biological Records Centre at CEH, along with local entomologist Ralph Hobbs, will be telling us all about grasshopper recording in Sussex and across the UK. We’ll also have local mycologist Martin Allison speaking about the fungi of Lullington Heath; Brad Scott and Sue Rubinstein, from the South East Group of the British Bryological Society, on the Sussex bryophyte atlas; Fran Southgate from Sussex Wildlife Trust with an update on Sussex Otters; and John Arnott, a volunteer with Chichester Harbour Conservancy, talking about the Seals of Chichester Harbour - the only breeding population of Common Seals in the eastern side of the English Channel. Emma Sherlock from The Earthworm Society of Great Britain is coming to give an insight into recording earthworms in the UK, and Henri Brocklebank, from Sussex Wildlife Trust, and Dan Watkins, from the Sussex Local Wildlife Sites Initiative, will be giving us an update on a new partnership project focusing on Sussex Local Wildlife Sites. 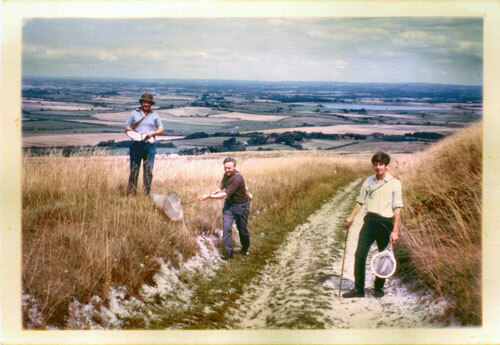 We’re very pleased that Tony Whitbread, organiser of the first ever seminar in 1990, will also be joining us and sharing his thoughts on 30 years of the Sussex Biological Recorders’ Seminar and the impact that biological recording has had on nature conservation in our county. There will be the usual stalls from local recording groups and societies and a plentiful supply of tea and biscuits! We’re asking for £4 to attend, and an optional £8.95 if you’d like the delicious vegetarian buffet provided by Veg Out catering. 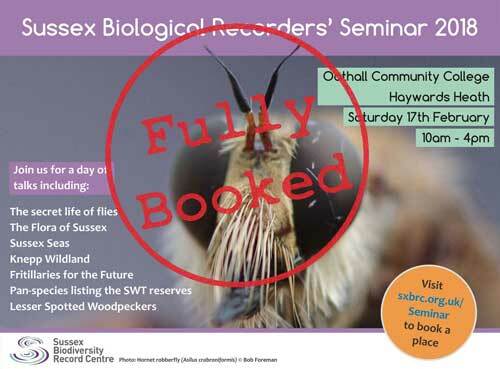 You can book your tickets online - please email loismayhew@sussexwt.org.uk if you have any questions. In March 2018 Portsmouth City Council was awarded a £79,700 grant to deliver the ‘Wild about Portsmouth’ project, aimed at raising the profile of the city’s Natural History Collection, which had been without a curator for over 10 years. The project has enabled the development of natural history advocates and a team of volunteers to work on and promote the collection, as well as engaging with people in a variety of ways, from family activities to specialist workshops. Since May 2018, work has been made to gain an overview of the collections, appoint volunteers and an assistant (starting in January 2019) and sharing newly found collections knowledge with local and national societies. The largest and most important collection is that amassed by HLF Guermonprez (1858-1924) who lived in Bognor Regis between 1892 - 1924. This collection was transferred to Portsmouth Museums in the 1970s where it is held in Trust. HLF Guermonprez was an avid collector, and the scope of his collection certainly reflects his enthusiasm for Natural History. He confined most of this collecting to Bognor Regis and the counties of West and East Sussex, recording where and when he found each specimen. Although some of his work is mentioned in publications such as the Flora of Sussex (1937) and the occasional entomological journal, many of Guermonprez’s collections remain under recorded. There are about 9,000 plants collected by Guermonprez in the herbarium. To date 3142 have been identified as collected from Sussex. 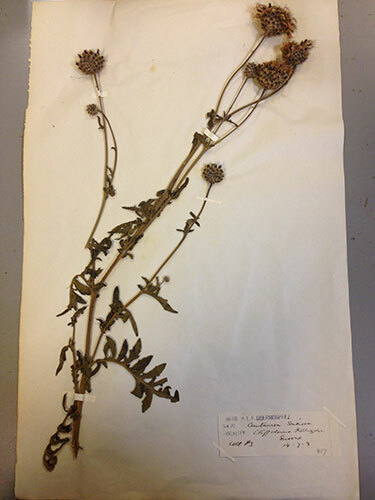 Other collections with Sussex specimens include the A W Westrup Herbarium, which contains 153 sheets of plants from Sussex, and the John Jenkins Herbarium. The majority of the collection are Lepidoptera and mainly from the Guermonprez Collection. Work has started on cataloguing the moth collection and a first analysis of the 561 records forwarded to Bob Foreman has shown ‘new spots on the map’. 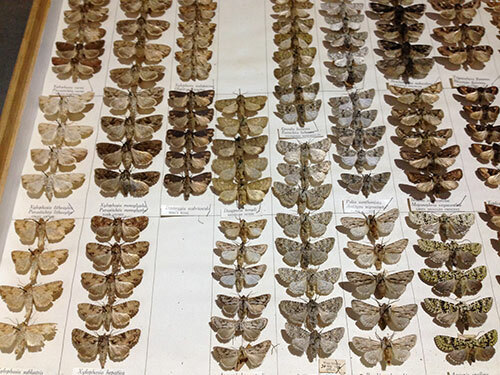 It is hoped that once the new ‘Insect Room’ is up and running, the moths and their data can be checked and added to the moth records for Sussex. There are about 800 taxidermy specimens in the Guermonprez Collection. Of these 116 are birds listed as being from Sussex over a date range of 1851 - 1925. The specimens from the mid-19th century, although part of the Guermonprez Collection, were previously in the Knight Collection. There are also a few small mammals collected in West Sussex. At present the herbarium is the easiest collection to access and volunteers have been the key to organising the collection into taxonomic order. The insect collections are currently awaiting relocation so that they can be accessed more easily. They will be moved to their new location by the end of January 2019 and, once in place, it is hoped to appoint entomology volunteers to work through the insect collections and catalogue them. By the end of the project in 2020 it is anticipated that the collections will be more readily available for consultation. Cataloguing projects will be driven by data requests and national recording schemes so that data can be shared more efficiently. The time has come for the SxBRC to a bit more honking of its own horn. On 25 September at 10:01am the number of species observations in the SxBRC’s database reached the 7,000,000 mark. This was thanks in no small part to the Sussex Ornithological Society which had, a few days earlier, sent us with the annual “bird migration” and it was during the import process of these quarter million records that the 7,000,000 threshold was crossed. 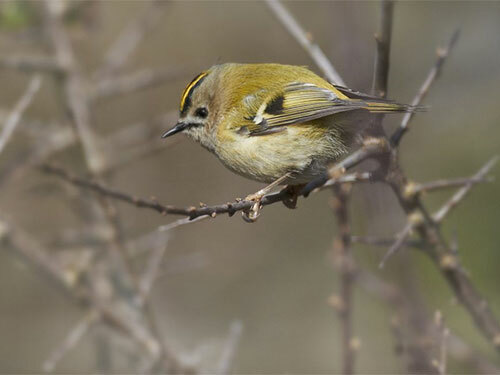 The actual record, the one that became the seven millionth, was of a Goldcrest that was seen in the Pannel Valley Nature Reserve in the far east of East Sussex at Icklesham on 6 January 2017. Of course, it is purely coincidence that this record should be a bird, it could quite easily have been any one of the 21,821 different species from the 1,712 families for which we have records in the database. For every square kilometre of Sussex we hold, on average, more than 1,840 records and it is the entire Sussex biological recording community that we have to thank for these records which allow us to report so comprehensively and thoroughly about the wildlife that occurs in any part of Sussex. 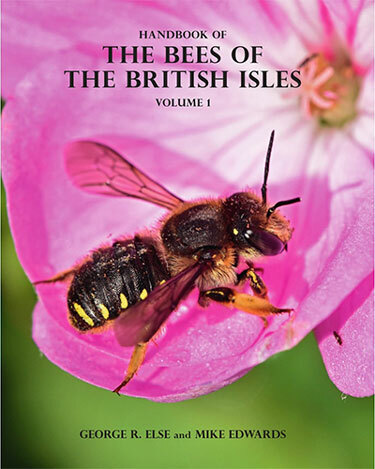 The 2-volume Handbook of the Bees of the British Isles represents the culmination of over 40 years' study of the British bee fauna by authors George Else and Mike Edwards. 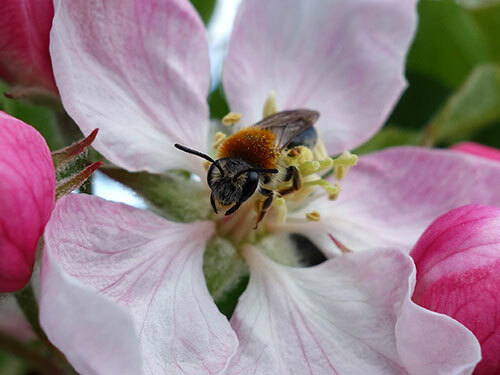 They have drawn heavily on their experience in their home counties of Hampshire and Sussex, both counties with a large proportion of the British bee fauna, as well as undertaking targeted investigations throughout the region. They have also used a wide range of published and personal observations. The volumes have been printed to a high standard on good quality paper, with a clear and uncluttered layout developed in association with printers Henry Ling of Dorchester. A notable inclusion in the price is a DVD providing large-scale copies of all the key illustrations. The Handbook of the Bees of the British Isles may be purchased from the Natural History Bookshop. Willow Emeralds ‘in-cop’ showing characteristic pale brown pterostigma. Like other emerald damselflies, this species rests with its wings apart. 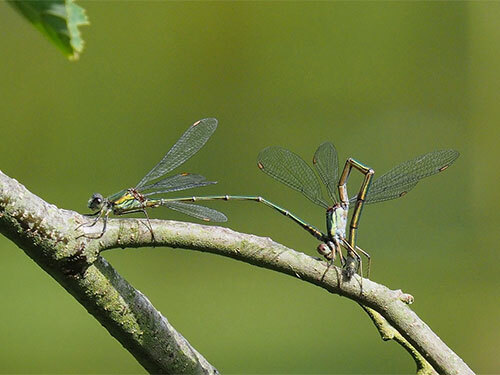 According to the British Dragonfly Society’s website the Willow Emerald Damselfly (Chalcolestes viridis) is a recent Continental colonist in the UK with the first significant number of records coming from Suffolk in 2009 and 2010 with more being seen in Norfolk, Essex and Kent. The first Sussex record is of a dead specimen found near Pevensey in 1979, the species was reported again at Warnham Nature Reserve in 2004 but after that, wasn’t seen until 2016 when Dave Sadler spotted two males here at Woods Mill in September 2016. In 2017 the species was seen on numerous occasions at Woods Mill and again too at Warnham. 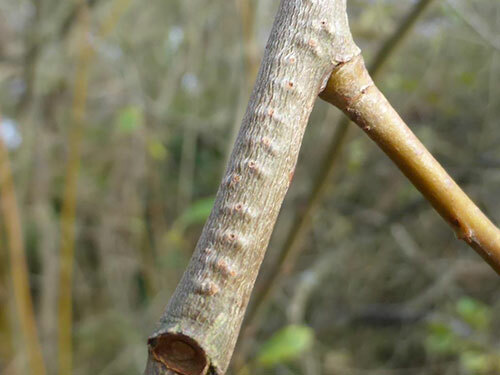 At Woods Mill females were observed ovipositing on the branches of willows overhanging the pond, leaving their distinctive “scars” in the bark. However, not only have Willow Emeralds been seen again at Woods Mill this year, reports have come to us of sightings in East Sussex, at Winchelsea and Broadwater Warren, the first records of living individuals from East Sussex. It appears that this species is not only becoming established in Sussex it is also spreading. The flight season is just getting underway and we would be very keen to get more records, so if you do see one of these distinctive damselflies, please either enter your records on the iRecord website or send them directly to Bob Foreman at the SxBRC. Black-shouldered Shieldbug (Carpocoris purpureipennis), first recorded in Sussex in 2017. Shieldbugs are the most popular and well recorded group of the Heteroptera. They are large, readily identifiable in the field and evident throughout the summer months. 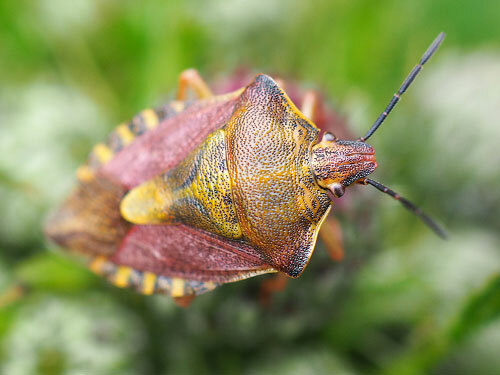 With only around 50 species if you include the squash bugs, they are not too tricky to identify and online resources such as British Bugs are a real help. A few years ago Graeme Lyons, the Sussex County Recorder for Heteroptera, started to talk to the SxBRC about producing an atlas of shieldbugs but rather than go for a book, we thought an online resource would be more suited, that way it can evolve as the Sussex shieldbug recording community also grows. The Sussex Biodiversity Record Centre with the help of Mark Robey (a freelance GIS specialist) put the atlas together with Graeme providing the text and most of the imagery. It covers all the Sussex shieldbugs, squash bugs, rhopalids and a few more families in there as a bonus. The Atlas of Sussex Shieldbugs allows you to click on the 10, 2 or 1 km square you are recording in and see what species, if any, have been recorded there and how many records have been made of them. It also allows you to click on individual species and read a bit about them including their identification including a photo, how to find them and their status in the country and in Sussex. These distribution maps will grow with time as more records are made and a more complete picture of our counties’ fauna is made. Click here to view the Atlas. Of the 6,834,363 (at time of writing) records we have in the database, 3,008,242* of those are of birds, 1,075,751 are of flowering plants and, as of today, there is now a third taxonomic group with more than one million Sussex records - moths! Over the past few weeks we have collated and imported approximately 80,000 new records (the vast majority of which were collected in 2017) and thanks to the avid moth recording community in Sussex, the total now stands at 1,000,873. Every one of these records has also been passed through the rigorous scrutiny of our dedicated County Recorder for Lepidoptera, Colin Pratt. I had hoped that record #1,000,000 would be of some spectacular or particularly scarce species but having checked the import logs it would appear that record #1,000,000 is of a Treble Brown Spot Idaea trigeminata - not particularly scarce or spectacular but undoubtedly an attractive little moth - It was recorded at Pagham Harbour last June. *Sorry, birds - I’m a bit moth obsessed and didn’t notice you passing the 3 million records milestone. 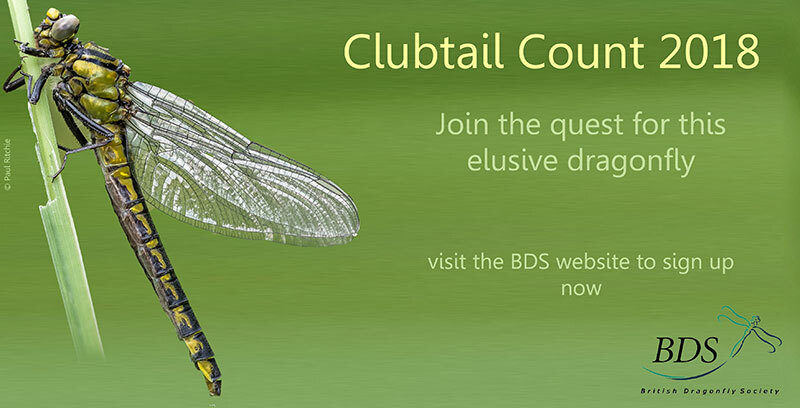 Join the quest for this elusive dragonfly. The Common Clubtail Dragonfly is a near threatened species restricted to a handful of unpolluted, slow flowing rivers in England and Wales. We desperately need to understand the population size and distribution of this dragonfly to conserve it, but records for this elusive species are patchy and dated. 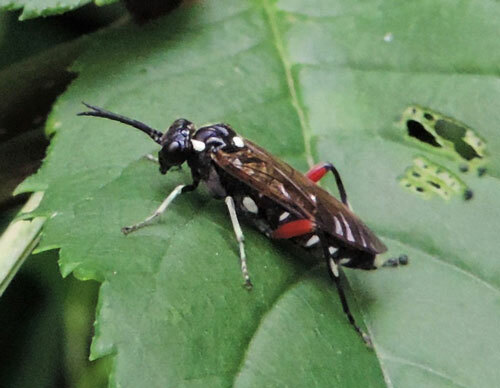 We are calling on all nature lovers to join us in the search for this beautiful insect. No previous experience in dragonfly identification is needed, we will teach you all you need to know to find this local specialist. You can give as much or as little time as you like, with all efforts making a valuable contribution to the conservation of a symbolic riverine dragonfly. It is fun and simple: take action now! If you live near the Sussex Arun visit our website to book your survey square now! If you have any questions, get in touch with our Conservation Officer, Genevieve Dalley. 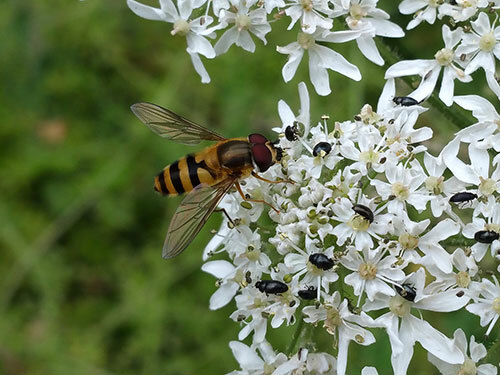 With the help of many volunteers, this project aims to collect robust data on the distribution and numbers of pollinating insects, to help inform research into the conservation of this vitally important group of species. 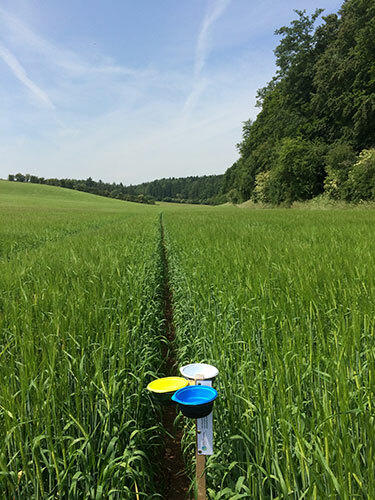 One part of PoMS is an intensive sampling survey across 75 1km-squares in England, Scotland and Wales, and this is the part of the project for which we are seeking help. The other part of PoMS is a public participation “FIT Count”, see below for more details. For this survey we are seeking volunteers to ‘adopt’ their nearest 1km square, either individually or as a small team of people. 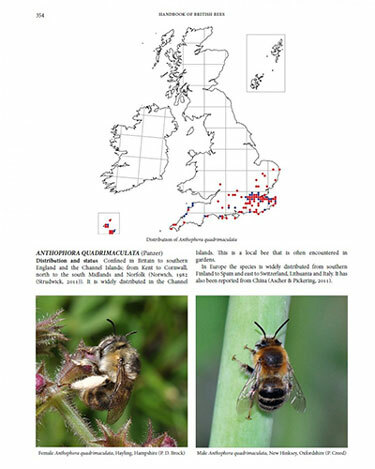 The network of squares can be seen at: https://www.ceh.ac.uk/sites/default/files/UK%20Pollinator%20Monitoring%20Scheme_posterv2.pdf. In particular we are seeking volunteers for three squares in your area: for West Sussex: one square near West Itchenor and another near Southwater; for East Sussex one square near Brighton. We’d be very grateful if you could spread the word among your networks to see if anyone is interested in taking on one of these squares. For anyone volunteering we will set up a meeting with a CEH member of staff at the chosen 1km square location for the first survey visit (due in late April 2018). We’d then ask volunteers to visit the square on 3 further occasions during summer to set out and take in water-filled pan traps. These need to be set out between 9 and 10am, and then collected in 6 hours later, with the insect specimens being returned to CEH (where the bees and hoverflies will be identified to species level, and other insects analysed at species group level). Volunteers are also asked to identify flowering plants (to species level where possible) for some measures of flower abundance in the immediate vicinity of the traps, and to carry out some FIT Counts (see below) during the middle part of the day (but there is typically some ‘down time’ in the middle part of the day). All the kit, maps and recording forms would be supplied by the project, and access permissions are already in place. Species records will subsequently be shared via NBN, subject to agreement with landowners. Read on for details of the FIT Count (which is a simpler survey that can be done by anyone at any location with flowers) - please pass on those details as well, but anything you can do to put us in touch with potential volunteers for the 1km surveys will be especially appreciated. An opportunity to have a chat with speakers and attendees; coffee break at the 2018 Seminar. 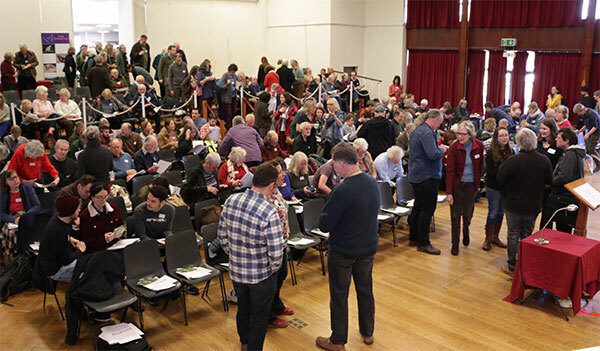 The 29th annual Sussex Biological Recorders’ Seminar (née Adastra) was held at Oathall College in Lindfield on 17 February. It was the second year that The Seminar has been held there and, with the benefit of the lessons learned from last year’s event all seemed to go pretty smoothly (helped in no small part by the considerably more clement weather than we experienced the previous year). After registration and refreshments the 260 attendees were treated to the usual complement of absorbingly informative and entertainingly delivered talks on a broad range of subjects. First on the agenda was Clare Blencowe (SxBRC Manager) who gave the audience an update on the SxBRC’s achievements over the past year as well a look ahead to the exciting plans the Record Centre has for the coming year. Clare was followed by Dr Erica McAlister, Senior Curator for Diptera, Natural History Museum, whose talk, “The Secret Life of Flies” was both fascinating and definitely not for the squeamish. Slides of tropical wingless marine flies and flesh-boring botfly larvae were shown as we were led from the extraordinary to the revolting. Her talk also highlighted some unusual recording opportunities for highly under-recorded species such as the Bat Fly, a wingless parasite of bats for which very few records exist. The coffee break was followed by Graeme Lyons with a whistle-stop tour of the Sussex Wildlife Trust reserves and the more than 10,000 species that have been recorded on them. The recording of the 10,000th species was marked by a presentation to young naturalist James McCulloch who recorded Phytomyza ranunculivora at Graffham Common. The Recorders’ Seminar is, we like to think, one of the highlights of the recording calendar but this year its position was underlined by the Sussex Botanical Recording Society choosing it to be the official launch of their magnum opus “The Flora of Sussex”, a stunning volume and absolute must have for any Sussex dweller with even the vaguest interest in natural history. The book’s creation, from the first glint in Paul Harmes’s eye to its arrival from the publishers was outlined in very amusing detail by Nick Sturt. Lunch... mmm lunch ...was followed by Sarah Ward giving us an insight into the fantastic work she and her colleagues and volunteers do with both the SeaSearch and ShoreSearch projects, helping to conserve marine habitats and species. Next up was Penny Green, the ecologist at the Knepp Castle Estate who explained the ecological principles underlying the Knepp rewilding project and the original motivations for embarking on it in the first place. The last two talks of the day both struck a more serious note, firstly Neil Hulme from Butterfly Conservation talking about the “Fritillaries for the Future” project and the efforts that are being gone to to save the regionally threatened Pearl-bordered and Small Pearl-bordered Fritillaries. Neil was followed by Ken Smith whose talk, “Latest on Sussex Lessers” detailed the precarious status of the Lesser Spotted Woodpecker and the efforts that are being made (through the use of highly ingenious monitoring equipment) to monitor its breeding success in the county. Despite both these talks being all about species that are under serious threat they were both highly positive in their outlook and showed what can be achieved when concerted action is taken. The whole day was excellently MC’d by Paul Harmes in his usual inimitable style and it would appear everyone went home happy. The Sussex Biological Recorders’ Seminar on Saturday 17 February is now open for bookings, and you’re invited! If you’ve ever thought about getting more involved in recording wildlife in Sussex - there is no greater introduction than coming along to the seminar-formerly-known-as-‘Adastra’. Peter Hodge has been keeping field notebooks for Coleoptera in Sussex since 1971. At Sussex Biodiversity Record Centre we are occasionally given old field notebooks by recorders so we can extract the information and turn it into biodiversity records which go into our species record database, and in 2006 Sussex Biodiversity Record Centre began the task of digitising Peter’s notebooks. Each notebook contains about 3,000 records, collected by Peter for surveys he carried out as well as casual records. For tasks such as these, volunteer power is vital seeing them through. Over the years many volunteers at SxBRC have been busy typing away over one of the fourteen notebooks, and by 2015 eight notebooks had been typed up, checked by Peter and uploaded into the Sussex database. As well as Peter, another 1,000 people have recorded at least one beetle in Sussex with records going back as far as 1850(?)! Most of our data now comes to us in a digital format, making it much easier to get into our database quickly, but notebooks such as Peter’s are valuable sources of ‘historic’ data that can show us what’s changed over the last 40 years. We were eager to get the rest of the notebooks completed so we could put together a comprehensive list of all the beetles recorded in Sussex and be able to share the data with national recording schemes, so in 2015 SxBRC applied for a Natural England Open Licensing of Species Data grant. This was a great opportunity to complete digitising Peter’s notebooks, as well as being an opportunity to look into how ‘Open Data’ works within biological recording and what challenges might face us in the future, including discussing with other Sussex Coleoptera recorders about making their data open and available on the internet. The final outcome would be an ‘as-complete-as-possible’, good quality Sussex Coleoptera dataset available for use under an Open Licence (CC-BY), minimising duplication of records and following recorders wishes with regards to sharing their data. 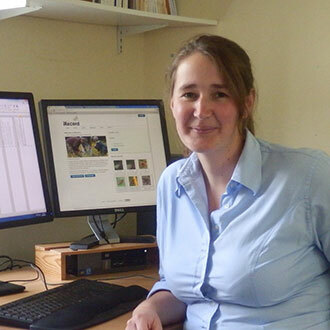 The project was carried out over 6 months, where staff and volunteers typed up the remaining 15,000 records as well as prioritising other beetle datasets for import. 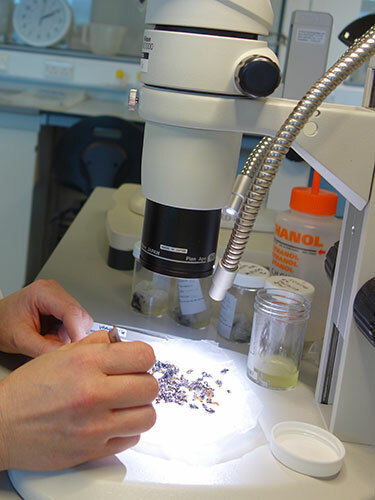 Gathering all the data together was just one part of the project, as we launched a consultation into data sharing with the Sussex beetle recording community. We also opened up dialogues with the 17 different national Coleoptera recording schemes in Great Britain to talk about how we could share data in the best way for them in the future - not just as a one off data exchange. After being digitised, verified, filtered for any data not to be shared, and formatted - we had 92,465 records ready to go onto the NBN Atlas! The NBN, or National Biodiversity Network, is a membership organisation that encourages sharing of biological data in the United Kingdom and makes it available through an online map - the NBN Atlas. The new Atlas was launched in April this year and currently holds data from 119 data partners, for 71,327 different species. From here you can download species data as well as look at it online and carry out analysis using the in-built atlas tools. This means that anyone who has discovered a beetle in Sussex and wants to check where else it’s been recorded can go onto the Atlas and search through our dataset, to see if it’s been recorded in Sussex before and where. The project is finished, but we’re going to continue adding to the dataset and working with recording schemes as part of our ongoing commitment to sharing Sussex Coleoptera. If you download the data and do anything with it, we’d love to hear about it! In the hedge a couple of metres from our back door in Sedlescombe, East Sussex (TQ782188) I have recently seen several examples of the rather handsome Privet Sawfly (Macrophya punctumalbum) wandering about on the leaves. I have not come across this here or anywhere else and have been unable to find any previous records from Sussex. There is a thin spread of records across the southern part of Britain and it is widespread in Surrey, so it is probably simply under-recorded in Sussex, though I am surprised I have not seen it in our hedge before as I usually walk past it several times a day. It may have cycles of relative abundance and scarcity. The larvae feed on ash, privet (Ligustrum vulgare), lilac and other members of the Oleaceae family and, rather unusually for insects of this kind, the adults browse on leaves of the same plants. There is a characteristic grazed patch towards the top right of the picture above. The picture is of a female and while males are found occasionally, the species is said to be mainly parthenogenetic. This record, which may be a first for Sussex, shows the value of walking round the house several times a day and looking out for anything interesting. It helps one to see things that would otherwise have been missed as in the wider countryside the eye is drawn on to more interesting looking sites. It also provides a little exercise for the relatively housebound. The piece of hedge where these sawflies occur does not look a particularly promising spot though wild privet and ash grow together there. “Hello! I’m Clare Blencowe - your new Record Centre Manager.” It’s something I’d meant to say sooner and now I find myself already a month into the job. Wondering, how did this happen?! I’ve been an admirer of the Sussex Biodiversity Record Centre for the best part of a decade, since I was one of Penny Green’s volunteers. I’ve valued the support of the team here, in the intervening years, in my voluntary role as the Sussex coordinator for Butterfly Conservation’s BNM recording scheme. Returning as the Record Centre Manager feels like an enormous privilege; I’m conscious that being the custodian of Sussex’s biodiversity information is also a great responsibility. I’m lucky that there is already an excellent data request service in place, providing professional bespoke reports for anyone wanting biodiversity information for sites in Sussex. I’m also inheriting good working relationships with a growing list of partners, including local planning authorities, government agencies, conservation bodies and other organisations to whom biodiversity information is important, such as water companies. Through these partner relationships we make high quality environmental information available to decision-makers in planning, land management and conservation across Sussex. These are services we can only provide by working closely with the local recording community: the people who are actually out there, in Sussex, identifying the great variety of species and habitats that exist and feeding that information through to us. The effort that goes into this - driven largely by volunteers, enthusiasts and folk who’ve simply made the time to notice and appreciate what’s around us - is hugely inspiring. And the results, from microscopic observations to landscape-scale surveys, as showcased at our annual Adastra seminar, are endlessly fascinating. We couldn’t handle all this information without technology: systems and databases enable us to organise, analyse and interpret all this data, as well as present it in accessible and interesting ways. I’ve arrived at a time when technology, especially online recording, is revolutionising biological recording, and is bringing with it a new set of opportunities and challenges. This makes recording groups and the people involved in recording as critical as they’ve ever been, to ensure data users can continue to have confidence in the quality of the information we provide. But these are not challenges we’re facing on our own. 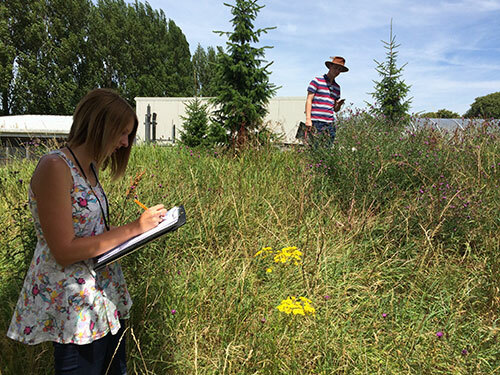 Here at Sussex Biodiversity Record Centre, we’re also part of the Association of Local Environmental Record Centres, and the National Biodiversity Network (known as the NBN). We will all need to work together to ensure biological data continues to be collected, valued, looked after and shared appropriately. As the saying goes: we live in ‘interesting times’. And I’m looking forward to getting stuck in. Spiked Rampion: Have You Seen It? © 2007 “Bossi” and made available under an Attribution-ShareAlike 2.0 Generic licence. Spiked Rampion (Phyteuma spicatum) is one of the rarest plants in the UK, but it is thriving in some parts of East Sussex and there may be plants we don’t know about. If you think you may have seen a plant, please send a photo and location (preferably a grid reference) to Bob Foreman here at the record centre or call 01273 497570. 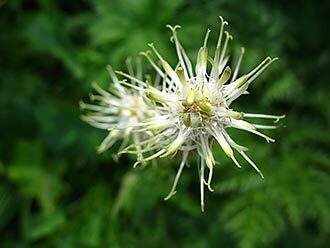 We have prepared a Spiked Rampion flyer to aid with identification in case you’re not sure what this plant looks like. Over the past month or so we’ve had a few sightings of Drilus flavescens sent in accompanied by wonderful photos. It is a Nationally Scarce beetle species which can be found in woodland and grassland on and around the chalk downs of South East England, and has a rather strange life history. The male is your average-looking winged beetle, just a few millimetres long with prominent combed antennae which are thought to pick up the appealing pheromones of the female. When a male follows the scent-trail, however, and finds the female, he’s in for a shock. The female is a wingless, grub-like monster weighing in about four times as big as him. 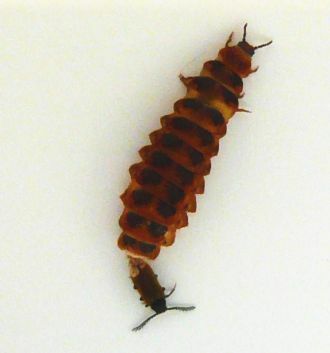 When a female beetle looks like this it is called a ‘larviforme female’ and you will recognise the more familiar example of this in the form of a Glow-worm female which is also like a caterpillar. 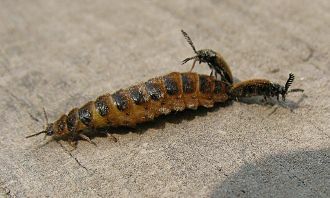 The male Glow-worm is a small black winged beetle and is attracted to the glow of the female’s curled abdomen. Like the Glow-worm larva, the larva of this species takes at least two years to mature, invading and eating about 3 or 4 snails a year, targeting progressively larger snails to sate its appetite. It moults and over-winters in an empty snail shell from about mid-September. The larvae look pretty spectacular covered in orange bristles, and their poisonous bite kills their snail prey which they then dissolve into a soup using their digestive enzymes. Pupation and adult emergence happens around May time and adults are then recorded up until late July, or this year into August. We have about 55 records of this species in Sussex, with only 16 of these records since the year 2000. If you have spotted this species we’d be grateful if you could send in a photo to Bob Foreman with details of where and when you saw it. 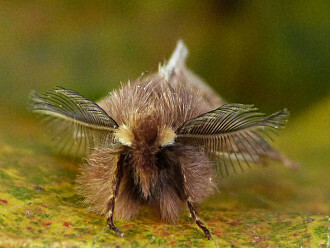 The Plumed Prominent moth has evaded capture for 14 years in Sussex, although the habitat that it requires hasn’t apparently changed in that time, we were starting to get worried that we hadn’t encountered it. 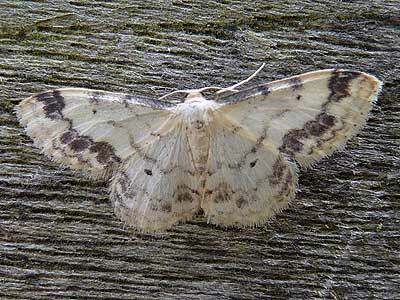 Well known for its disappearing acts, this species skulks around Field Maples (on which its larvae feed) on the chalk downs in the south of England, and in Sussex it prefers the scarp slope woodlands of West Sussex. So we knew where to concentrate our efforts; all we needed was a bit of patience and some warm clothes. In 2011 a small group of us tried several times at two of the most likely locations but all we got were Bricks and Red-green Carpets. Luckily if Plumed Prominents haven’t turned up by 9:00pm you know you can head home. The male Plumed Prominent flies early on in the evening and then the female comes out much later on in the evening, but we figured if the males weren’t on the wing it was unlikely that the females would be. Despite carrying traps and generators up and down steep hills and dogged perseverance we didn’t manage to catch up with this species in 2011. Deterred? Oh no, this just makes it more of a challenge, it’s all part of the chase. So on 8 November we headed to the hills to look for the Plumed Prominent again, or the ‘Bonfire Night Moth’ as it is so called due to its emergence around this time of year. We set the traps up in the usual places, and after 20 minutes we decided to go to the bottom of the hill and check the trap there, we bumbled around there as there was a distinct lack of moths and we started looking at snails, harvestmen and plants - we are easily distracted. We then walked back up the hill to check the other traps and, as we neared the first trap we didn’t feel very hopeful, it was just part of our regular routine. Hang on - what’s this by the trap? Yes! Our first ever Plumed Prominent, and what a looker; adorned by a furry cape and huge feathery antennae he was everything we had hoped for. There were another three males in and around our traps so we were very pleased. These were the first Plumed Prominents encountered in Sussex for 14 years and it has been great to confirm its continued residency in the county. This success highlights the importance of persistent and targeted survey work for species that haven’t been recorded for some time. Some species are scarce and some species are under-recorded as to see them one has to go out at unsociable hours and stand around in inclement weather. The Plumed Prominent is a rare, under-recorded and enigmatic species; a species that I would like to see again. When the leaves are just on the turn in the autumn, we think it’s the best time to be in the woods - not only to enjoy the beautiful colours, but also to be looking for some of our more under-recorded native fauna. Have you ever noticed leaves on trees, such as oaks and hazel, that have been carefully rolled over, or that have curious blotches or silver wiggly lines on them? These are signs of fascinating lives going on within these leaves - whether it is in a woodland or in your garden there are leafminers at work. 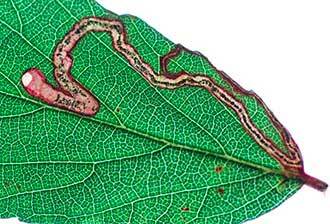 Leafminers represent a cross-section of specialists from several species groups such as moths, flies and wasps. 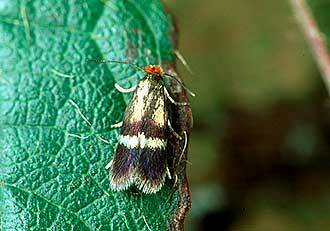 We’re on the lookout for micro-moth leafminers so we will tell you a bit about these. Most species of leafminers have one or two species of plant or tree that they will feed on. The adult micro-moth will lay its tiny egg on the leaf of its food plant and when the larva hatches from its egg it burrows in to the leaf. It will then spend some or all of its larval phase between the epidermal or outer layers of the leaf, feeding in safety away from predators’ eyes. The mines themselves vary in shape and size and this, along with knowing what the food plant is, enables us to identify a majority of the leaf mines made by micro-moths, although some need to have the adult reared to confirm which species has been growing inside when it finally hatches out. There are a few different types of mine including blotch, gallery and blister - some are lined with silk, some create folds in the leaves and some have small windows that have been created by feeding larvae - they all have their own distinguishing features which, with the aid of a key, can point towards which species it is. If you hold the leaf up to the light you can often see the inhabitant busily eating away at the juicy green tissue within. 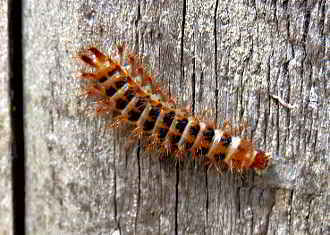 As the larva feeds it usually leaves a trail behind it, which gets wider as they get fatter. When the larva has filled its boots, it will emerge through an exit hole and pupate, sometimes dropping to the ground and pupating in the soil. Some of the later stages of the larvae come out of the leaf and carry on feeding in the safety of a self-constructed funnel-like shelter that they roll in the leaf until they are ready to pupate. The Orange-tip, one of our earliest non-overwintering butterflies and a sure sign Spring has arrived. Photo: Paul Marten/Sussex Wildlife Trust. 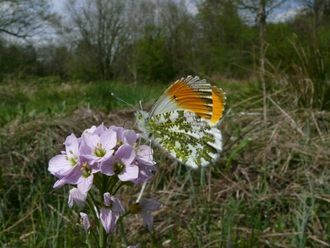 One of the first signs of spring is glimpsing the unmistakable bright orange flashes of the male Orange-tip Anthocharis cardamines as it patrols along country lane verges and hedgerows looking for a female. Emerging in April they are one of our earliest non-overwintering butterflies to see, and a sure sign that blissful sunny spring days are here and butterfly recording can start in earnest. The male butterfly is easy to spot when it is on the wing, with its vibrant orange wing tips; a wonderful sight for us but this bright colouration is thought to be a warning sign to repel predators. This bold butterfly wouldn’t make a very tasty snack due to the mustard oils which will have built up in the body when it was a caterpillar feasting on its foodplants, such as Garlic Mustard Alliaria petiolata and Cuckooflower Cardamine pratensis. We’re looking to collect as many Orange-tip records as we can in order to fill the map of Sussex for the forthcoming Butterfly Conservation Sussex Butterfly Atlas and we’d like you to send in your records. Drop us a line when you spot a male Orange-tip, whether it’s in your garden or in the countryside we’ll be grateful to hear from you. We’ll need your name, the date you saw it, and where you saw it, preferably an OS grid reference, and a road name and town - the more detail the better. Please send your Orange-tip records to Bob Foreman or 01273 497570.